With the Menu getting made again, I decided to follow it with a Kid Friendly easy to pack lunch dish. 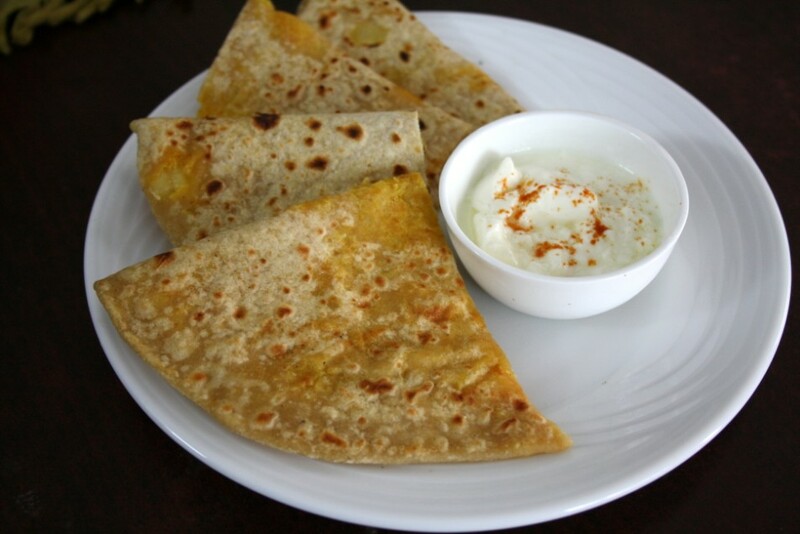 These parathas are stuffed with cheese and aloo. Basically I had blended the aloo with little masala for the boys, whereas I stuffed the aloo with some cheese for Konda. Konda and I had made a pact that she will carry parathas twice and other two days some rice dish, while the last day will be noodles. So this sort of menu really works out well. Now I got to plan all the different parathas I can think of. Sad part being I can’t do the same with the boys pack. They refuse to eat anything most days. Having this menu in places helps a lot as we really have to plan things well ahead. Athamma has gone for a vacation, so it’s just us. We were also happy that boys have grown up enough not to cry because she is not around. We took them out for dinner and we had our drill on what’s to expect and do. The school appears to have just begun, and their first assessment is already on us. One fails to understand if the assessment is for them or for us. Either ways we are on spot! In a wide bowl, take the flour, salt and slowly add water to knead to a soft dough. Let it rest while you prepare the stuffing. Wash and prick the potatoes. Microwave for 7 mins. Soak in water and peel off the skin. Make sure it’s fork tender. In a bowl, mash it well. Add grated cheese, chili powder, salt, cumin powder. Mix everything well. Make into small balls just enough for the stuffing. Heat a tawa to cook the parathas. Dust the surface. Pinch out balls from the dough. With your hands, press out the sides, place the stuffing in the center, cover with the sides to make sure the stuffing is fully covered. Dust the balls, using a rolling pin, roll out discs of 6 – 7 diameter discs. When the tawa is hot, cook on both sides with oil smeared on top. Most times you can apply once cooked with little butter if your kid likes it. I sent pickle and curds with it, it was good as such. Nice parathas..stuffed parathas are my favourite. 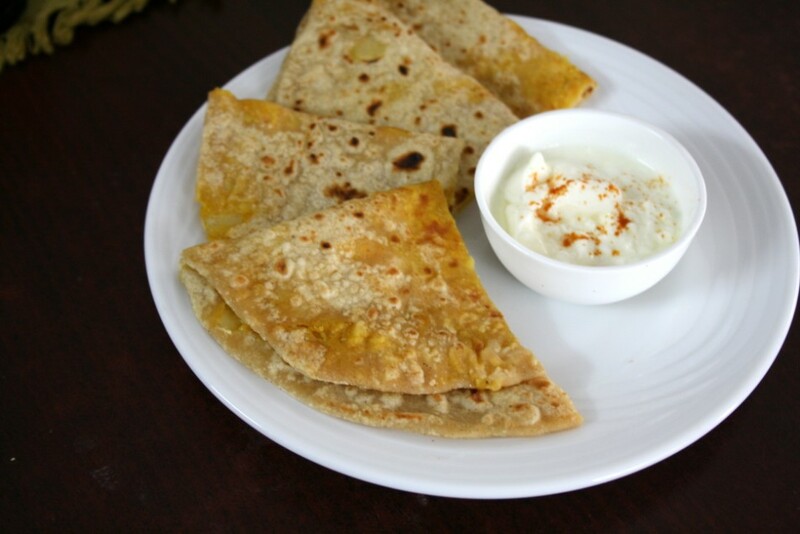 Simply love this stuffed parathas. Lovely combination of aloo & cheese.